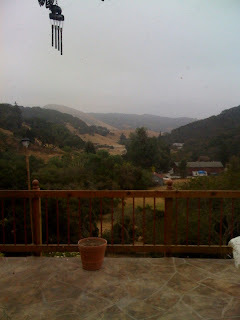 This photo is another taken this morning from the porch of the main house on the land where we stayed last night. I was writing earlier today about my walk up the mountain with Kevin. After carefully making our way back down the steep incline, I began asking Kevin more about his views regarding matters of faith. I was interested to know what his current thoughts were. Pastors usually have some topic or teaching they are currently thinking about and studying. There's usually a sermon they are writing and revising in their mind. I figured Kevin would have something interesting to share. He said that his last sermon was on 1 Corinthians 13, the chapter about the qualities of love. He had an interesting suggestion about reading that chapter. Kevin said to read the chapter inserting your name in place of the word love, and consider how well the chapter describes you. That chapter of 1 Corinthians 13, helps us understand the complexity of love and the multi-dimentional nature of love. I thought about Jay's building workshop. He has a workbook for participants, and the workbook shows pixtures of the tools someone needs to build a house. The Bible is sometimes referred to as the book of love. In some respects, the Bible is simply a workbook describing "tools" for building love - loving relationships, families, and communities. Yet another way of looking at the name of God is to see (in the Hebrew) the expression Yah v' ah. The "v" sound in Hebrew is "and." So, the name of God is simply Ah "and" Ah. In Sandcrit, "Ah" is considered the sound that conveys the infinate expanding of the universe. So, Ah "and" Ah is simply understood as infinite universe and infinite universe. Interestingly, the name for God in Arabic is Allah or Ah L' Ah. The "L" sound in Arabic is like the "V" sound in Hebrew -- it conveys "and." So, the name of God in Hebrew and the name of God in Arabic is simply Ah "and" Ah, which is understood from Sanscrit as The Infinite Universe "and" The Infinite Universe. As mentioned previously, the word for love in Hebrew is "ahava." To understand this Hebrew word, we hear Ah Ha v' Ah. The word coneys infinite universe three times. Having this Hebrew understanding of the word love and the name of God, we can understand why John says, "God is love" (1 John 4:8) and again "God is love. Whoever lives in love lives in God, and God [lives] in her/him." (1 John 4:16) The Hebrew word for love and God are so similar, that they seem to almost be the same. That's a lengthy explanation, but I share that study on love and the name of God becuase it was on my mind as I was visiting with Kevin about the multi-dimentional nature of love as understood from 1 Corinthians 13. As we were visiting, two scriptures came to mind. According to the teaching of Ephesians 4:12, the pastor's roll is to equip people for more effective living (loving or being a conduit for for God through the characteristics described by 1 Corinthians 13). Hebrews 12:1 offers a teaching on effective living that advocates simplicity and minimalism in the statement, "Throw off everything that hinders." The implication is that we should discard the material clutter from our lives that makes us less effective, as well as the emotional / spiritual / mental baggage that "hinders" us from more effective living. The main insight and reminder I gained from my conversation with Kevin is that the Bible contains tools for more effective living / loving. These tools and their use are described in the Bible. In the same way that a variety of tools are needed to build a home, a variety of tools and skills are needed to love more fully and effectively. I'm interested in taking time to study and revisit the tools of building love.